To view all 2019 Rocky Mountaineer Vacation packages, click 2019 Vacations. If you are unsure which package to choose, let a Western Canada-based agent assist - we have the expertise to ensure you are making the most of your time here, and you will receive our lowest rates and best deals on the Rocky Mountaineer packages below for 2019 - guaranteed. Right now, for a limited time, we are offering incredible bonus offers for 2019 - you won’t want to miss. Submit a quote request to us now for details. New for 2019, the following ultimate in adventure package has been introduced. Take your journey to new heights with this jaw dropping mountain adventure package that pairs a heli-hiking getaway with your Rocky Mountaineer rail experience. With mountains as far as the eye can see, the Cariboos are stunning in every season. Your days will be spent flying to rarely visited high-country terrain where your guided group will hike and explore a landscape that few others have seen. Colossal glacier views, ridge walks, and canyons await. Don’t be intimidated – your trip will be tailored to your ability and interest and the contingencies are covered. CMH’s highly trained guides know the terrain, are equipped with all the gear, and make sure every adventure is on this side of your comfort level. Nestled in stunning BC backcountry, Cariboos Lodge is a cozy home away from home that will make you feel instantly welcome with 27 rooms, a games room, swimming pond, music room, massage therapy, sauna, a plush lounge and outdoor hot tubs. Fully equipped with all the modern amenities, Cariboos Lodge is casual yet refined and staffed with a dedicated team of guides, hosts and culinary talent. Meals are served family style and your guides will join you and the other guests to swap stories. The Eastbound packages start in Vancouver and end in Calgary and the Westbound packages start in Calgary and end in Vancouver. With just four package start dates available, in each direction, in July and August 2019, we expect these incredible mountain adventure packages to book out very early. Click on the package links below for more information or submit a quote request to us. The 2019 Journey Through the Clouds Mountain Adventures Eastbound itinerary is the same as the above, but in reverse and you only transfer along the Icefields Parkway (no sightseeing tour). Imagine a picture postcard mountain community, and you’ll be dreaming of Canmore. This authentic mountain town offers stunning views and a laid back atmosphere. Just 20 minutes from Banff, Canmore is home to accomplished athletes, artists and artisans. With walking and cycling paths meandering through the town, Canmore attracts people passionate about an outdoor lifestyle. Hike, mountaineer, explore caves, or take an eye-opening helicopter ride. Wildlife roam freely here, and so can you. Ask your Rocky Mountain Holidays agent for the best places to view wildlife, as well as for the popular hiking trails. There are several museums, cafes and restaurants to explore. Wander down Main Street and discover the unique boutiques and eclectic art galleries. Eat a mouth-watering meal or try craft beer brewed with crystal clear mountain water and all-natural ingredients from a local watering hole. After all that exploring, you’ll need first rate accommodations. You’ll be lodging at the luxurious Malcolm Hotel. Opened in spring 2018, this newly-constructed 4-star resort offers stylish contemporary design in the heart of the Canadian Rockies. Close to all the action of Canmore, this refuge from the wilderness will indulge all of your desires. Unwind in the heated pool and hot tubs, or dine upon Western Canadian cuisine in one of Malcolm Hotel’s signature restaurants. There’s something different about this place. It’s so serene, yet so alive! Sprawling across a spectacular mountain landscape, and just a 45-minute drive from Banff, Kananaskis encompasses several protected parks, unspoiled streams and untouched forest. You can hike, mountain bike, ride horses, play golf, go white water rafting, and fish from the shores of the Kananaskis lakes. Or, if you prefer, just simply breathe in the fresh clean mountain air. Whether you’re seeking complete solitude under a sky full of stars, or bursts of excitement, you’ll find it in Kananaskis. Your home away from home will be the Pomeroy Kananaskis Mountain Lodge. This newly renovated, world-class resort sits snuggled in rugged terrain, and is framed by majestic mountain views. The Lodge boasts several restaurants, from an upscale pub to fine dining. On site, the Kananaskis Nordic Spa rejuvenates your body and your spirit, much like exploring the outdoors does. Welcome to the alpine wonderland of Sunshine Village, one of three major resorts located within Banff National Park. Sitting on top of the Continental Divide at an elevation of 7,200 feet, you’ll have uninterrupted views of this awe-inspiring mountain terrain. Known as Canada’s number one hiking area, Sunshine Village offers tranquil nature walks, gondola rides, biking, hot springs and is only minutes from the town of Banff. Six hiking trails wind their way through the untouched wilderness around Sunshine Meadows and Sunshine Village. Surrounded by the jagged peaks of the Canadian Rocky Mountains, there are breathtaking views everywhere you turn. After enjoying your fill of the natural beauty on display, spend the night at Sunshine Mountain Lodge, a one-of-a-kind luxury resort that’s both rustic and refined. Sit by the fire at Chimney Corners, gazing out the enormous bay windows while munching down a hearty lunch. If fine dining is on the menu, the Eagle’s Nest features western delicacies like salmon, AAA Alberta beef and bison. Sunshine Mountain Lodge may feel remote, but it’s the perfect place to be pampered. Introduced in 2018, the Journey through the Clouds Outdoor Adventures packages are popular to those wishing to be more active on their holiday. Cycling, hiking and canoeing are amongst the activities you can choose to explore your surroundings. Sonora Resort was first integrated into Rocky Mountaineer packages in 2017, for guests to experience the absolute ultimate in indulgence: luxury in a wilderness setting. 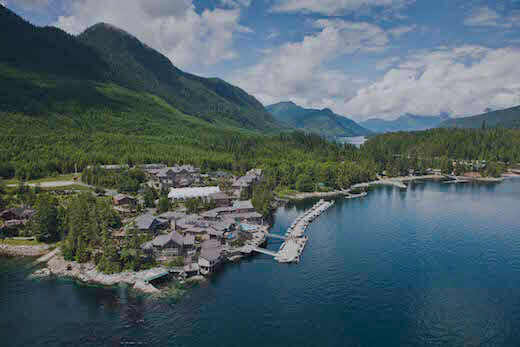 Sonora resort is located on a remote island, off the West Coast of British Columbia, and is a jewel amid one of Canada's most alluring and pristine environments. The following packages include two unforgettable nights at Sonora Resort. Accessible only by air or sea, this retreat add-on is paired perfectly with the contrasting jaw-dropping scenery of the Canadian Rockies. You will need a PDF reader such as Adobe Reader to view the 2019 Rocky Mountaineer Holiday packages. You can download Adobe Reader HERE. Packages are typically confirmed within a few minutes or up to 48 business hours after receiving a deposit payment and required guest information. Response time is dependent on suppliers and availability. All packages are subject to verification and availability. The Rocky Mountaineer holiday packages below can be easily customised. Please view all 2019 Rocky Mountaineer vacation packages below. To better assist you and to save time, submit a Rocky Mountaineer train quote and we will select a suitable package based on your preferences. 2-3 days / 1-2 nights Rail Only Packages - Connecting Vancouver to the Canadian Rockies. 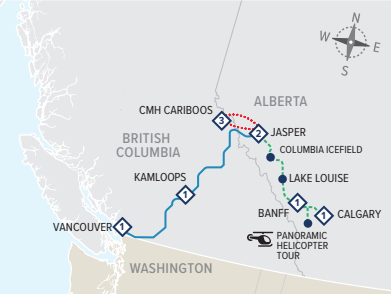 Vancouver to Lake Louise, Banff (via Kamloops) and Jasper (via Whistler and Quesnel). This is the minimum package duration you can book through us. Calgary Circle Tour Package - Start and finish your holiday in Calgary. Circle route which includes 4-days onboard the Rocky Mountaineer train. Vancouver Circle Tour Packages - Start and finish your holiday in Vancouver. 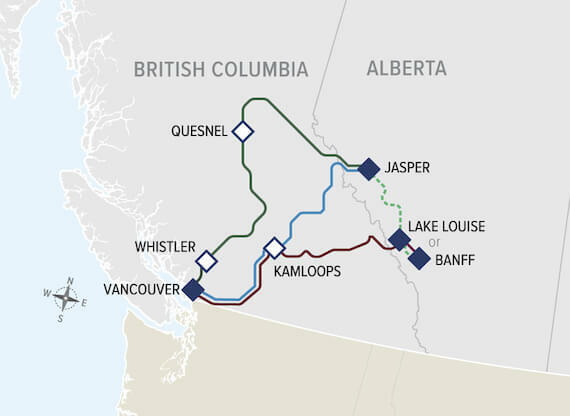 Circle routes which include 4-days onboard the Rocky Mountaineer train. One-way Tour Packages - Connecting Vancouver to the Canadian Rockies and Calgary by rail and motorcoach. One way itineraries which maximise your time here in Western Canada. Coastal Passage Vacations from Seattle - Connecting Seattle to the Canadian Rockies and Calgary by rail and motorcoach. Coastal Passage Self-Drive Vacation from Seattle - Connecting Seattle to the Canadian Rockies and Calgary by rail and car rental. Rail and Self-Drive Vacations from Calgary - Connecting Calgary to the Canadian Rockies and Vancouver by car rental and rail..
Self-drive freedom combined with the 2 or 3 day Rocky Mountaineer train. Rocky Mountaineer Sonora Resort Packages - Introduced in 2017, these packages include two nights at the luxurious wilderness retreat, Sonora Resort, located within the pristine environment of the Discovery Islands, just off Vancouver Island. The Sonora Resort is a perfect addition to your trip of a lifetime experience. Trans-Canada Independent Tour Packages - Connecting Vancouver to Toronto and Halifax. Packages which include 3 nights onboard the VIA Rail overnight train. Travel across Canada by train. 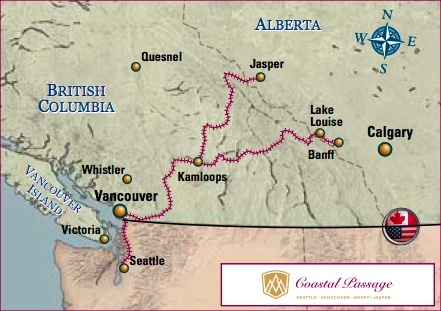 The Rocky Mountaineer Coastal Passage Route made it's debut in 2013. This is an excellent way to start or end your vacation in Seattle. View the VIDEO. Please contact us for more information and to book these Trans-Canada rail vacation packages in 2019. A 7 night round-trip cruise to Alaska out of Vancouver can also be added for the ultimate adventure! To receive the best discounts, deals and value added on all Rocky Mountaineer vacations, use our Rocky Mountaineer Train Quote form to contact us.